Is there a better alternative to PlainCalc? Is PlainCalc really the best app in Mathematics category? Will PlainCalc work good on macOS 10.13.4? PlainCalc is a buttonless, algebraic-entry, mathematical calculator with variables. To use PlainCalc, type an expression or assignment and press Return or Enter. 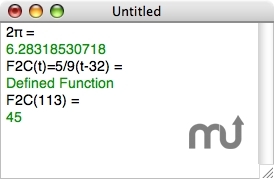 Unlike most calculators I've seen, PlainCalc allows you to indicate multiplication by juxtaposition, e.g., you can write 2?r instead of 2*?*r. The size and position of the window is now stored with documents. There is a Preferences dialog where you can set text colors and a timeout. The % sign is a built-in constant whose value is 0.01, so that for instance you can write 73% instead of 0.73. PlainCalc needs a rating. Be the first to rate this app and get the discussion started! Improper recursive functions will no longer freeze or crash PlainCalc; instead, you will get a message saying "Timed Out" or "Calculation Crashed". If your language preferences specify that the decimal separator is a comma rather than a period, then PlainCalc expects you to enter decimals using the comma, and reports results that way. In this case, you must separate the parameters of a multi-parameter function using semicolons rather than commas.